12 x 60 office trailers offer the maximum amount of space! Pick from our ready to rent stock or tell us exactly what your envisioning and we will customize the unit just for you. Let our experienced crew come out to your site and block and level your unit for you. Need MORE space? 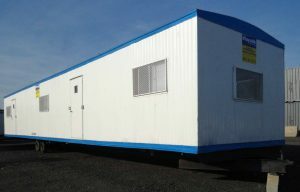 12 x 60 Office Trailers are also available as a double wide! If you are looking for a more long term mobile office solution speak with a Wayside team member about our modular building options. We will take care of everything from delivery to set up.